A radiator cap is more important than most people think. 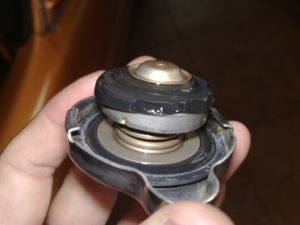 The radiator cap is often overlooked as being a cause of engine overheating. 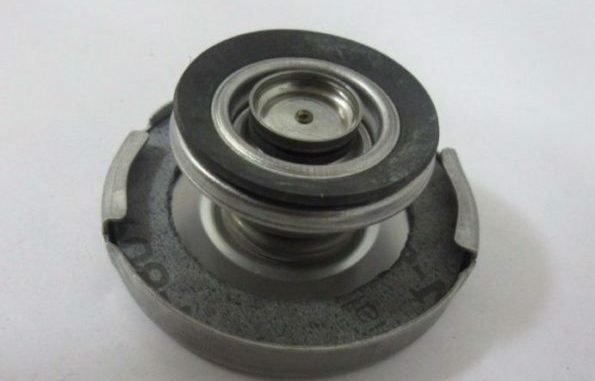 A radiator cap looks simple but, is critical for a properly operating cooling system. A faulty radiator cap can result in engine overheating, loss of coolant or major engine damage. So, Pressurized cooling systems help prevent overheating and coolant loss. Also, They raises the coolants boiling point about 3-degrees F for each additional psi above atmospheric pressure. As the engine warms up and the coolant expands it becomes pressurised.. The caps pressure relief valve allows pressure to build up to a specified level, then lets excess pressure escape. In an (open) systems found in older vehicles, excess pressure escapes to the atmosphere through an overflow tube. As air enters through the overflow tube, coolant will be lost. Here, as the coolant expands it goes through the overflow tube into a reservoir. The cap now serves as a vacuum relief and siphon valve. As the engine is cooling the coolant also contracts.This allows it to be siphoned back into the radiator. Radiator caps also serve as pressure relief valves. They will prevent excessive pressure. Unchecked high pressure could cause damage to the radiator, heater core, hoses or water pump seal. The pressure cap also prevents radiator hoses and tanks from collapsing. As the engine cools it causes a vacuum in the cooling system. This vacuum draws the coolant back in the system instead of air. Always check the cap during routine maintenance. Never remove the cap when the engine is hot. With the engine off, place a rag over the cap and remove it. Turn it counterclockwise about 1/4-turn until it reaches the safety stop. Allow all pressure to vent before removing the cap by pressing down and turning it counter-clockwise. If the radiator cap is stuck, fluid cannot get released. This will cause pressure to build inside of the radiator, causing the hose to leak or break open. 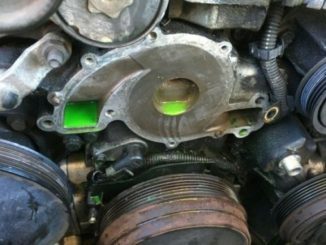 If you notice coolant near the radiator or the radiator cap, then you clearly have leaky coolant. Check to see if the radiator has holes in it or if the cap looks worn or damaged. If so, then replace the cap. Coolant goes into the reservoir tank as it expands. The cap is released by the pressure and the coolant is sent toward the overflow tank. If you have a bad cap, the coolant will get released too quickly and cause the reservoir to boil over. 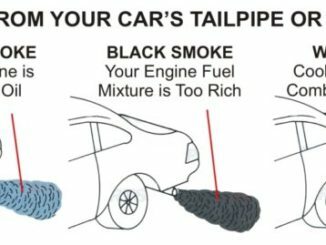 You may have a bad cap if the radiator hose collapses. The vacuum won’t be released properly and it will cause the radiator hose to collapse during the cooling down period. If this happens, inspect the cap to see if there is any damage. If there is, replace it immediately. When your cap does not seal properly, air will get inside of the cooling system. This will cause air pockets to get inside of the heater core, thermostat, and radiator hoses. As a result, the engine will start to overheat because it cannot sustain a temperature that is consistent. Leaky coolant or air in the cooling system can lead to an overheated engine. 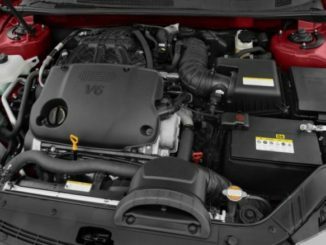 If you notice your engine getting too hot, don’t look under the hood unless you’ve turned the engine off. That way, the engine can remain cool as you check it out. 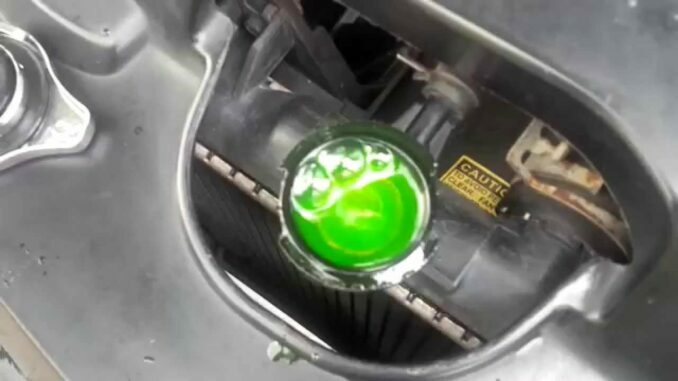 If there is coolant near the radiator cap, there could be damage to the pressure cap. Check for that and replace as needed. Since radiator caps are so important and are relatively inexpensive, why not just replace it with a new one. Also inspect the overflow tube connecting the filler neck to the overflow reservoir for looseness, cracking or obstructions. Check the radiator filler neck sealing surfaces for nicks, dents or corrosion that could impair sealing. Inspect gaskets for looseness, cracking, hardening or other damage that allow pressure leakage and coolant to escape. Finally, Make sure you are using the correct mixture of fluids.